Express by Holiday Inn Bristol North has a brand new look. Visit us soon to see our contemporary, refurbished lounge bar, reception & meeting rooms.The Express by Holiday Inn hotel in Bristol North combines a warm welcome with modern facilities, value-for-money & a convenient location. 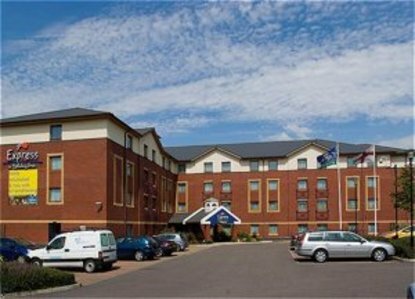 With air conditioned bedrooms, WiFi (charges apply), free car parking & a licensed bar our Bristol hotel is a popular choice for leisure & business guests alike.Our air conditioned bedrooms can accommodate up to 2 adults & 2 children & feature en suite power shower, satellite TV with pay-movies, tea/coffee facilities & hairdryers. WiFi (charges apply) & a comfortable desk area can also make your stay more comfortable.Holiday Inn Express Bristol North is ideally located in a business district within easy reach of the motorway network and less than 1 mile from Bristol Parkway train station, which offers direct rail connections to London, the Midlands, Wales & the South West. Bristol Airport is just 18 miles away. Leisure visitors are also spoilt for choice with a wealth of attractions within easy reach including Bristol Zoo, @Bristol and the historic city of Bath.Our Bristol hotel also offers 2 refurbished meeting rooms providing a perfect backdrop for your conferences.We look forward to welcoming you to the refurbished Express by Holiday Inn Bristol North.